My favorite part about Roper’s Sierra High Route is the vision he had to create a timberline trek that minimized the effort required to confidently enjoy such spectacular and reasonably comfortable, if not rather intimidating terrain. More important, he gave people the confidence to leave the trail, and perhaps, do a little exploring of their own. Steve Roper was (is) one of my wilderness heroes and is responsible for inspiring a great deal of my own style and preferences for wilderness travel. With that preface, we left the Sierra High Route this morning at Twin Island Lakes to see if we could enchain walkable terrain between there and some place cool up north. Our maps wouldn’t guarantee success, as their 20m contour lines were insufficient to identify the minor but substantially impassable cliff bands that could impede our progress. Above Twin Island Lakes, a surreal and beautiful world of jumbled and rocky topography exists. The seemingly benign contour lines on the map simply cannot be reconciled with what the eye actually sees. Therefore, one realizes that the map’s best place is in your pocket and your own two eyes, combined with some inductive reasoning flex and a bit of blind faith, should be relied upon the most when moving north to the headwaters of this vast cirque. By doing so, an amazing world of labyrinthine corridors of tundra and heather unfolds as you walk between ominous cliffs. After a bit of walking (an hour or two or three, depending upon your objectives), you find yourself at the highest tarns in the cirque, wondering which of the unholy-looking notches in the cliffs above will allow your passage back to the western side of the Sierra Crest. Wondering about this myself, I started doing the math, reconciling our remaining food quantity with the distance to an alternative exit point, and I wasn’t really liking the answers I came up with. So we continued up. We found ourselves early in the afternoon seeking shade behind a tiny cliff, refuge from the scorching orb in the sky we so desperately wanted to escape. By the seventh day into a Montana trek, I’m usually cursing a snowstorm and wishing for the warmth of the sun, but today I was feeling some disdain for it and felt like it was against me. Its heat and UV exposure have been relentless up here! After careful scouting, we decided to climb a notch that would lead to the Rodgers Lakes Basin on the other side of the Sierra Crest. Viewing the col from below, the terrain looked imposing and seemingly vertical, with cliff bands at the top, but we knew that a head-on perspective would lie to us so we proceeded towards it in faith. Tundra turned to talus in short order, and talus turned into steep talus. Steep talus – of the sort you crawl up on all fours rather than walk up, led to unstable talus and then unstable and slippery scree leading up through giant parallel cliffs splitting the fall line of the col. Keep in mind, this is all good old fashioned Class 2, Type 2 fun, and we do this voluntarily for entertainment. Fortunately, the walls of the cliffs provided good handholds, and little ledges, with a few welcome Class 3 moves that can allow you to maintain stability and stay out of the bowling alley of the main scree gully, a nice option when traveling with others. This sort of maneuvering constitutes the final and very exciting last few hundred vertical feet, and soon you are at the crest looking down towards Rodgers Lakes and in the far distance, the weirdly out of place Waugh Lake Dam and its reservoir. With a few more than a few hours of daylight left, we decided to try a totally unknown route (to us) and see if we could hold our elevation at around 11,000 feet, heading north. We hoped that this contour line would lead us into what we only suspected was the magical realm of Marie Lakes. The whole idea worked out rather well, actually, and it turns out that only very small amounts of easy climbing – a few Class 2 and 3 moves here and there – were required to traverse the ledges leading around several buttresses all the way to Lower Marie Lake. Some of the ledges traversed over the top of alarmingly large cliffs. The degree to which one becomes alarmed, however, is directly proportional to the time spent looking down over them, so it’s best to ignore the exposure and keep walking. We arrived at Lower Marie Lake in the late evening and enjoyed a final sunset descent to her shore, where we are camped for the evening. The Marie Lake where we are camped is in the midst of rugged, open country. A several-hundred foot high waterfall roars into the lake at its head end from the giant hanging valley where Upper Marie is found, and the high peaks of the Northern Ritter Range surround our cirque, looming a few thousand feet above to the southwest our of camp. Once again, there isn’t a soul in sight, and we’ve been completely alone with no encounters with humans since our ascent up Glacier Lake Pass four days ago. Today was our hardest day, but also our most rewarding, having completed a route where we had almost no beta, and wondering most of the day where our destination would really be. We had secretly high hopes of making the route to Marie Lakes a go, so it is immensely rewarding to be camped here tonight! At this point in the trek, appetites are increasing and food rations are running low. Today I was hungry enough, and confident enough in my tenkara rod’s ability to do its job, that I began stealing food from the rations of days not yet lived. It should work out ok, unless like a pyramid scheme, collapses somehow before judgement day comes at the end of the trek. I also get less picky and less INTJ about what I’m eating. Tonight’s dinner: three ounces of freeze dried beef stroganoff, five ounces of smoked wild sockeye, two ounces of my tsampa cereal mixture, a one ounce packet of almond butter, and a bunch of Parmesan cheese, crushed red pepper, and trout fry seasoning. It might sound gross to you, but frankly, it may have been the best meal I’ve ever had. Tomorrow: turning south, in the general direction of our cache, which we’ll pick up in a few days. 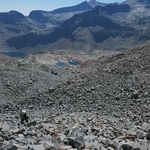 – Climbing Sierra rubble (talus) to exit the headwaters of the basin above Twin Island Lakes. 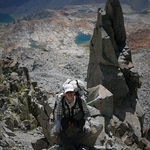 – Chase at the top of the col leading to Rodgers Lakes. 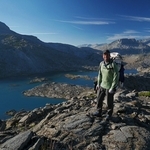 – Dan on the ledges above Lower Marie Lake in the evening, before starting our descent to camp.